So I wasn’t reaaaaalllly planning on getting anymore animals anytime soon but I kinda stumbled over this guy this morning. Literally. I was out walking the dog this morning after taking the kids to school. On our way back, right in front of our house, I saw this little guy in the grass. It took Bowser a second to notice him and then he tried to eat him. Couldn’t just leave him there, we have TONS of cats in the area and I couldn’t see a nest (it’s a huge tree). So I brought him inside and stuck him in an old check box. Found a wild bird rescue place on island but they pretty much just gave instructions and then said if you can’t get him back into the nest or you don’t see the parents, have fun raising your bird! I did stick him out in the tree for an hour in a makeshift nest to see if mom or dad came and I didn’t see anyone. So back inside he came and I had to go on the hunt for baby bird formula. (Moanaloa Pets FTW!) So far he is eating and hopping around in his box. I texted a picture to the bird people and they think he is a dove. After looking online I agree, and it looks like he is maybe 14 days old? Thankfully I have some baby bird handfeeding experience from the old days of working at a pet store. The kids think he’s adorable and I just have to keep the dog from eating him. Gotta love an unexpected houseguest! Find a baby bird yourself? Take a peek at this chart to see what to do with it! 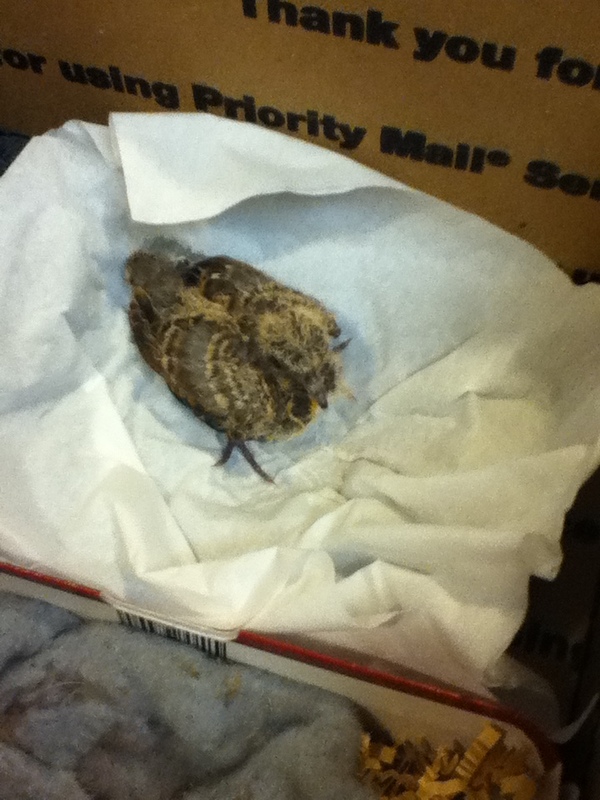 I found a baby bird – now what?